GaryMoller.com - Health, Fitness - Naturally! : Sarah Ulmer Retires due to injury - now how predictable was that? Sarah Ulmer Retires due to injury - now how predictable was that? "Olympic champion and New Zealand sporting great Sarah Ulmer has announced her retirement from cycling. New Zealand's first and only Olympic Games cycling gold medallist has been battling a perplexing sciatic nerve injury in her leg since it forced her out of last year's Melbourne Commonwealth Games. A recent visit to a surgeon convinced the 31-year-old it was time to end the most frustrating period of her glittering career. She will be remembered for her golden year in 2004 when she set a world record in winning the women's 3000m individual pursuit at the world championships in Australia. Several months later she bettered the record in claiming gold at the Athens Olympics. After a year's break from the sport, she switched to road cycling and was consistently impressive there before injury struck. "I've been toying with retirement for longer than I actually expected," Ulmer told 3 News today. "It's been a pretty frustrating year from the cycling side of things. I've been in and out of doctors and medical specialist and MRI machines. "The crunch with the actual decision was a trip to a surgeon in Christchurch who didn't give me a greater than 50 percent chance that he could improve me." The retirement of Sarah Ulmer comes as no surprise. 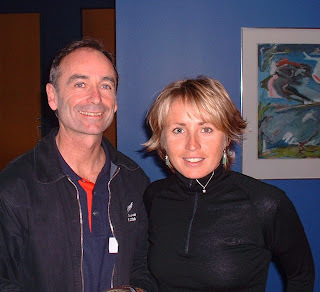 When I stood by the finish line as she blitzed the field of the International Womens' Tout of Wellington, organised by George Sandoval, just weeks before the last Commonwealth Games, I commented to a cycling mate, Paul, that she had just blown her chances at the Games. Not too many months earlier, I had attended a cycling coaching conference at which she was the honoured guest. It was during that conference that she revealed some of her training secrets (and flaws - one being her poor diet and the other being the misunderstanding of the importance of recovery). That she was heading for burnout was pretty obvious. I had seen the signs before: for example; when an athlete gives to the demands of exhausting advertiser photo shoots, luncheons and dinners, exhaustion is the inevitable consequence and so this was to be for Ulmer. The signs were there: Stress, weight loss and chronic injury. Am I speaking a load if rubbish? Read these articles and judge for yourself. An athlete in a sport like cycling or running can be one only - athlete or business person - never both. One or the other. So; does the athlete make money or win medals? It is difficult, if not impossible to make both happen concurrently in a sport like cycling. 20 years ago there was no such thing as the sports scientist and the personal trainer in New Zealand outside of a few academics. Sports conditioning of new Zealand's best was the domain of the coach who had been there and done that themselves. Now we have the sports scientist who has inserted their expertise between the coach and the athlete. Few have been there and done that, having learned their trade via the text book and the ivory tower of academia. We have gone downhill ever since, with just a few exceptions. Most sporting injuries of a non-violent derivation are to do with coaching, diet and lifestyle. they are not medical issues - even if there is a physical sign like a protruding lumbar disc. Seldom will medical interventions like drugs and surgery bring about a lasting "cure" as has been so well illustrated by Ulmer. Lorraine's autobiography "On the Wings of Mercury" illustrates so well how much winning once and winning again and again has to do with the ivory from the neck up.